This painting was selected for the National Exhibition of Wildlife Art (NEWA 2012). Sold at the Spring Exhibition, Natural World Art Group (NWAG), Banham Zoo, April 2013. 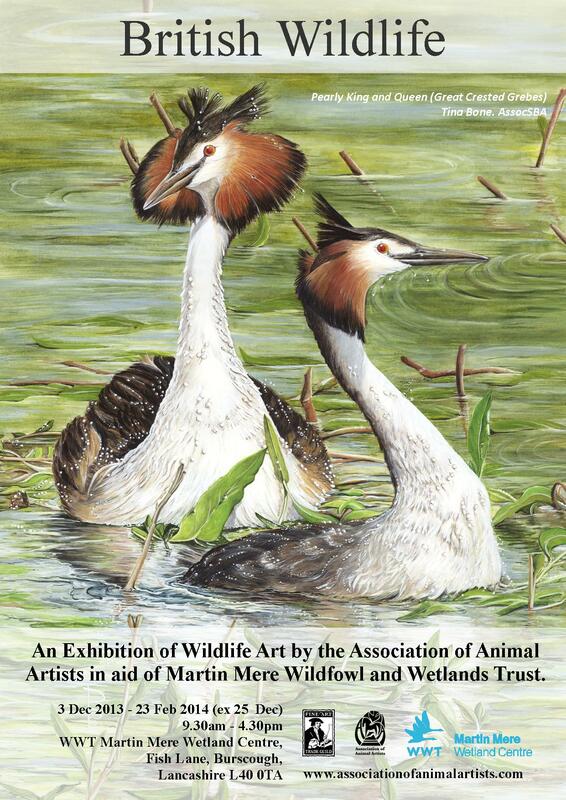 Featured on the Publicity Poster for the Association of Animal Artists’ Exhibition, at the Wildfowl and Wetlands Trust Martin Mere, Martin Mere Wetland Centre, Burscough, Lancashire L40 0TA, 3 December 2013–23 to February 2014. 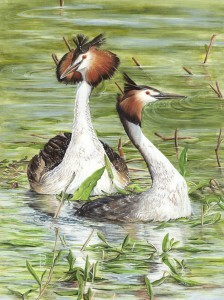 Great Crested Grebes, Podiceps cristatus, amongst Amphibious bistort, Polygonum amphibium. Resource material: A “right place, right time” event. My husband and I were staying at Top Lodge Caravan site (Fineshade, Corby, Northamptonshire NN17 3BB—the BBC’s “Middlemarch” was filmed here) and walked around the nature reserve. We stumbled upon a hide and whilst admiring and snapping the wildlife another couple sauntered in. We got talking and discovered that they were professional photographers. I mentioned that we had been out recently on a caravan rally and had taken some pictures of grebes, but that they were not very good because the birds were distant. I was treated to several beautiful photographs on their camera and my grateful thanks go out to Jan and Andy of Jandy Photography for letting me use their beautiful imagery, and to Paul Mason for his fabulous stuffed resource ‘Grebey’.